Active galactic nuclei (AGN) are understood to be powered by the release of gravitational energy during accretion onto supermassive black holes (SMBHs). Reverberation mapping (RM) is a powerful probe of the kinematic and spatial distributions of ionised gas near the central SMBHs. Scaling relations have been established for the broad-line regions and for the inner edge of the dusty torus, and recent evidence strongly challenges the standard model of accretion disks. In principle, black hole mass, accretion rate and distance can all be estimated by RM, but higher accuracy and better understanding of systematic errors are needed to realise this potential. Interferometry is beginning to resolve the cooler regions of nearby AGN, and wide-angle multi-object spectroscopic monitoring surveys are extending RM to higher redshifts. 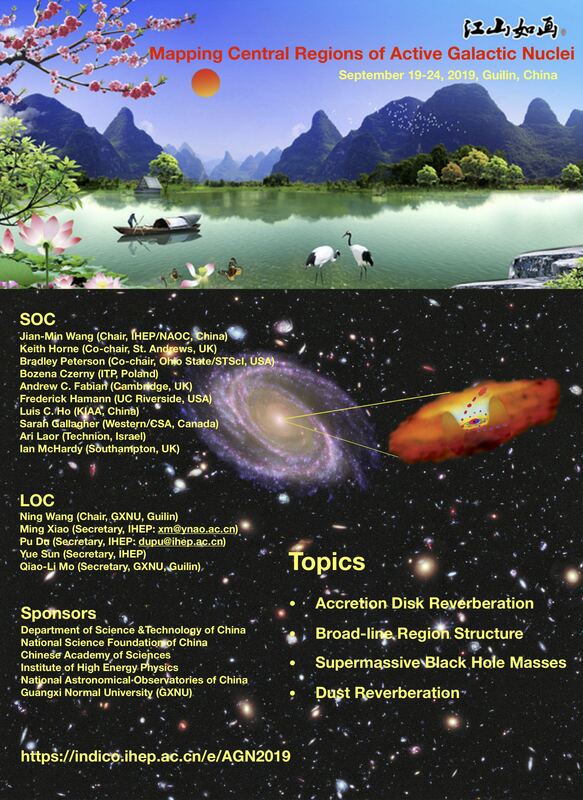 Our view of the black hole accretion flows is sharpening thanks to increasingly intensive AGN monitoring for RM and microlensing campaigns and advances in interferometry. The recent success in detecting gravitational wave signatures from merging neutron stars and black holes highlights the prospects for detecting GW signals from AGN. How do anisotropic and/or distributed sources of ionizing radiation affect reverberation mapping? How may we improve the quality of black hole mass estimates? What is the structure and origin of the BLR? What physical connection between the dusty regions and the accretion disk? What are the sizes and temperature distributions of the accretion disks? Does the standard disk model require revision? What gravitational-wave signatures may we expect from AGN? Where are the close binaries of SMBHs? Important Dates: Jan 20th, 2019: 1st announcement Feb 12th, 2019: Registration is open. Jun 1st, 2019: Registration deadline.